Posted by Toy Lady in Holidays Countdown, Home, Musings, random stuff. How sad is it that I’ve been sitting around complaining about not being able to upload photos for, what? two weeks? And then, when I FINALLY get it figured out, I’ve got, um, nothing interesting to upload! This was an official market week for me, though I kind of took it easy there. I really didn’t need much, and I do try to be mindful of what I buy – especially at this time of year! It’s so easy to just buy, buy, buy, you know? I did grab a HUGE head of broccoli – it’s very late in the season, but broccoli holds up much better than some of the more delicate veggies. And of course, my new favorite potato – fingerlings. I’d always taken a pass on them, assuming they were “gimmick potatoes,” but they’re not. They have a creamy texture that’s different than either a russet or a waxy potato. We LOVE them and try to keep them around as much as we can – I really can’t get them after about March or April. One of the farmers – the egg and dairy guy – has started bringing what he called “checks”-basically, they’re like egg seconds. The eggs are a little irregularly sized or shaped, and some of the colors are off, but they’re perfectly good eggs. And they were $2 a dozen! Given the fact that I paid $1.89 a dozen for the last eggs I bought at the supermarket, I am more than happy to pay an extra penny apiece for organic, cage-free, non-GMO eggs! Oh, and the Carmex! As it gets colder in the mornings, I find my lips chapping more and more, which HURTS! I keep a tube or a tub of this lip balm in the pocket of virtually every coat I own. Plus my purse. And my desk. And pretty much any other place I may think it would be handy. So imagine how thrilled I was when I snagged a bunch of them for 50 cents each! So we’re hoping planning to have a crew of contractors here this week. Wish us luck – we’re putting in a second bathroom! Well, half a bathroom anyway. Between the fact that The Jar is, well, not a fan of strangers wandering around upstairs, and the advancing age of our respective parents making it difficult for any of them to climb our steep stairs, we decided that this was easier than moving to a bigger house! Of course, the whole dog-hating-strangers thing makes it a little problematic – he’ll be spending mornings in doggy daycare (where, hopefully, he’s learning some new people doggy skills) and afternoons at work with me, where I’ll keep him until the coast is clear. Wow this is going to be fun, isn’t it? 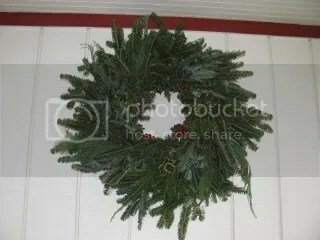 Last weekend Peeps and I picked out our Christmas wreath – I can’t believe I never got a photo! I don’t want to cover the house and yard with lights and sparkly things – just a simple wreath on the outside is really all we need. I will admit, though, that I’m kind of a sucker for the fancy wreath – not the ones covered with bows and ornaments and glue-gunned glitter, though. 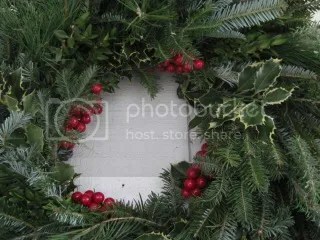 I love the wreaths with the mixed greens – some spruce, fir, holly, all of the greenery. And, of course, some tasteful fake holly berries! The perfect place for a robin’s nest in the center again next spring! And once again, it’s time for the weekly menu plan. Since we’re expecting to have a less than relaxing week (to say the least! 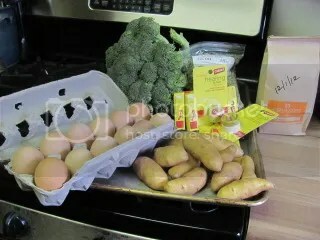 ), we’re going to keep this week’s meals as low-effort as we can. Although the forecast is calling for “unseasonably warm” temperatures for most of the week, it’ll likely also be rainy and dark early, which means soup weather! Monday – Shockingly (or not),we never got the Canned Lentil Soup with Frozen Kale and Pretend Sausage made that we’d planned for last week. Well, it’s made now and it’s going to be Monday’s dinner. Tuesday – Gotta love those freezer meals! We’ve got a quart of lamb shanks cooked with great northern beans – such a lovely dinner to come home to, especially when it’s already cooked and just needs reheating! Wednesday – We also defrosted a package of Peeps’s Asian chicken wings – he made an extra package and shoved in the freezer a while back . I can’t help thinking this will be perfect with some steamed rice and part of the giant head of broccoli I brought home this weekend. Thursday – And again with the soup! The bean guy was at the market this weekend, and when I saw that he had dried peas, I just couldn’t get the idea of split pea soup out of my head! Yum! Friday – You know, one of the best things about pizza night in the winter (besides, of course, the pizza! )is having the oven running and the house all toasty warm. One of the best things about having the oven running is that I can roast a bunch of beets for another day. Assuming, of course, I remember them! I need to write myself a note or something – I’ve already forgotten for two weeks in a row! I would like this to work today. I always like your pictures and yes, you will have a bird building a nest before you know it. Lovely wreath by the way. How is your Christmas cactus and how is the CAT. I sure am sending good vibes re: the CONSTRUCTION project. Good Jar. How neat on the eggs! A place just down the road has a sign up advertising “fresh brown eggs,” but my 2 trips up the road have not resulted in any eggs. Kind of frustrating. Best wishes with the remodel project! The remodel project has started. Yikes!